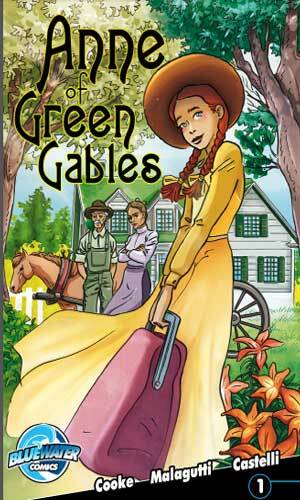 Anne of Green Gables is a new comic offering from Bluewater Comics based on the classic children’s series of the same name. Written by CW Cooke and drawn by Giancarlo Malagutti, this first installation recounts the story of how a reserved, elderly couple who live on a farm send to the local orphanage for a young boy to help out with the chores and are sent Anne by mistake. Anne, initially delighted by the prospect of a family, is devastated to learn of Mr. and Mrs. Cuthbert expectation of a boy. However her sanguine nature and incessant but inventive chatter quickly charm her potential benefactors and, in the end, they decide to keep her. The original stories were written by Lucy Maud Montgomery in the early 1900s and have since been adapted numerous times for film and television, both as live action and animated series. Why, then, a comic book? The drawings add a visual element to the story while preserving the active intimacy of reading that is lost from TV and movies. The comic book format also elevates the conversations between the characters, which are a key component of Anne’s story, to a higher level of importance than would be in a picture book format. And what better way to introduce a younger generation of readers to these characters than through the delightful blend of literature and artwork that are comic books?